Leonardo’s idea for a double-deck bridge is surprisingly modern. It recalls the function of bridges in some modern metropolis where the two-way flow of traffic is arranged on different levels. Leonardo doesn’t mention what this project was actually for, but it is clear that it is a way of organising the two-way circulation system in such a way that doesn’t create traffic jams or obstructions. It is likely that Leonardo had an ideal city in mind where the spaces dedicated to work and leisure are separate and realised on different levels. The two levels don’t communicate, and can be used for a two-way traffic flow or to differentiate between social classes or trade. At the extremities of the bridge there are two inclined planes that connect the upper and lower levels. 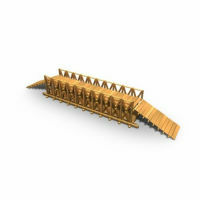 This double-decked bridge might have been used also to connect two roads at different levels in the ideal city. On folio 23r two versions of the bridge are present, with and without the inclined planes. Leonardo also stresses the structural sturdiness of the bridge.